Holy crap this is cool. 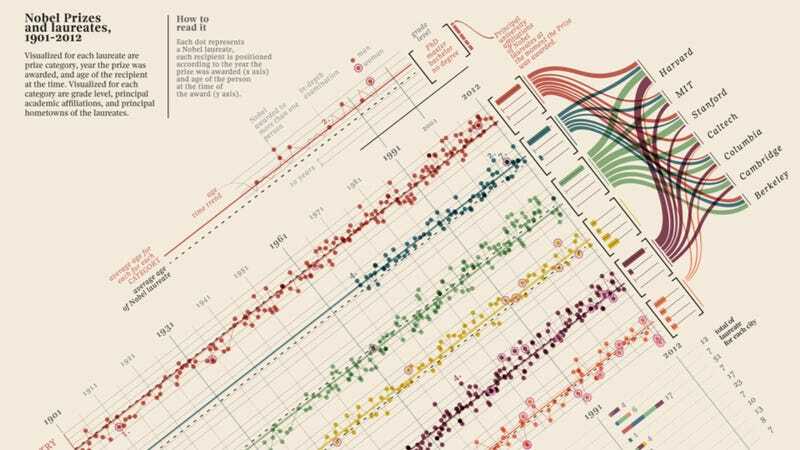 Over on Brain Pickings, Maria Popova has an exclusive English version of a visualization (originally designed for La Lettura, a Sunday cultural supplement to the Italian newspaper Corriere Della Sera that features a weekly column dedicated to data visualization) that compares Nobel Prizes and laureates for every year since the award was created in 1901. Visualized for each laureate are prize category, year the prize was awarded, and age of the recipient at the time, as well as principal academic affiliations and hometown. Each dot represents a Nobel laureate, and each recipient is positioned according to the year the prize was awarded (x axis) and his or hear age at the time of the award (y axis). Check out the enlarged version over on Brain Pickings.